Brooklyn, NY - Disturbing video making the rounds on social media appear to show an NYPD officer launching into an obscenity laced tirade before manhandling a car service driver, physically yanking him out of his car despite the protests of EMS workers who were at the scene treating the man. Sources told VIN News that the incident took place within the confines of the 66 PCt. 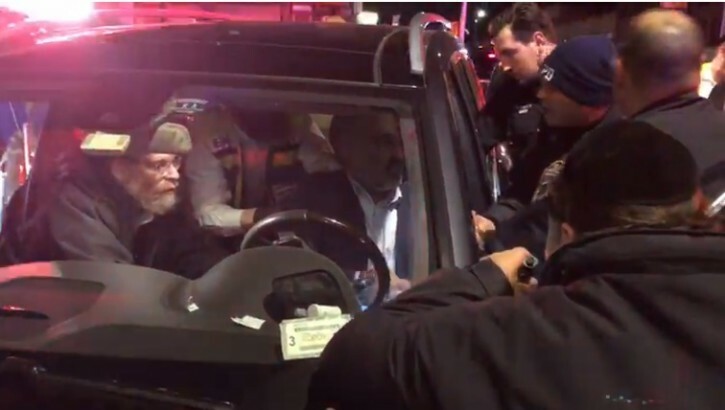 but 70 Precinct cops responded, and that the driver had suffered a medical episode just before the incident took place, hitting several parked cars before smacking into a support pole for the elevated train tracks at McDonald Avenue and E18th Street. The accident was reportedly called in to the NYPD by an off-duty corrections officer and, according to sources, police mistakenly responded to the scene believing that the corrections officer was in distress. EMS workers who also rushed to the accident scene were reportedly told that the incident appeared to be a DWI and that the vehicle’s engine was still revving despite having crashed into the metal support beam. EMS workers were already treating the driver when police arrived on scene. Video shows the driver sitting behind the wheel of his car and not resisting officers in any way. According to sources, the officer who can be heard shouting expletives and roughing up the driver was concerned that he might attempt to flee the scene since the engine of his vehicle was still running. The NYPD said that no details were available yet on the incident. However, asked about it at a media event earlier this morning, Chief Of Detectives Dermot F. Shea said he saw the video and stressed that police officers are to be held at a higher standard. “The incident will be up in review, and I’ll leave it at that” he said. the 70th is known to be a place where all the rejects of the NYPD go including the commanding officers, never has anyone from that precinct gone onto greater things since the failures go there. I'd love to see them do that to a Pakistani ...They treated me the same when I dropped my bookkeeper of on 13th ave ,when she exited from the rear of the car. They boxed me in and ran after my bookkeeper made her come back to verify that I wasn't a car service ....Abuse of authority ...anyone with a badge falls in that category. the same compulsion that blacks, hispanics and basically everyone has today. what's your point??! Probably not the same compulsion as yours to post nasty comments about "from" people. You evidently don't know the 70. Former commanding officers have become the Chief of the Birmingham Alabama PD, the Chief of the Chicago PD, head of security for Lower Manhattan Improvement District, and high positions at 1PP. Not sure what happened here, but in general, if a police officers says: Step out, you are obligated to follow their instruction. It the car was still running, this was a very dangerous situation for everyone. FYI, if you are stopped by police for any reason, put your hands on the steering wheel at the 10 and 2 position and follow instructions. Police are pumping Adrenalin when they stop a car. Be smart. Remember how Sean Hannity defended the officer Justin Volpe who eventually plead guilty? Remember Hannity's apology to Abmer Louima? That psycho Justin Volpe of the 70th Precinct was sentenced to 30 years in prison for what he did to Abner Louima. He is scheduled for release in 2025. I saw a similar incident in Marine park. The driver was ramming cars and refused to get out, probably drug related. The Police were totally under control, bent over backward sto not attack him. Your statement started correctly, "Not sure what happened here,". I wasn't there but I did see some video and it seems like the driver was incapacitated. While I do not know what happened, I can tell you that NEVER should anybody yank a accident victim and risk causing further injury. NEVER, NEVER. If there was wrongdoing by the driver that is addressed at a later point or in the hospital. Anybody could have reached for the keys or button and shut the engine off, that is not an excuse for possibly causing a person to become a paraplegic. “ Remember how Sean Hannity defended the officer Justin Volpe who eventually plead guilty? Any particular word? Or did you mean I should near to spell Dumpkof? Not sure there is a correct English spelling for that. “ You evidently don't know the 70. Former commanding officers have become the Chief of the Birmingham Alabama PD, the Chief of the Chicago PD, head of security for Lower Manhattan Improvement District, and high positions at 1PP. Who was the Chief of the Birmingham PD? And when?